A cemented carbide ball with diameter D is vertically pressed into the specimen with the test load F. Steel balls are no longer allowed in the current standard. After releasing the load the mean diameter d of the residual impression is measured and the surface area A is calculated. The Brinell hardness is the load divided by this area. The factor 0.102 arises from the conversion of the old unit Kilopond [kp] to the SI-unit Newton [N]. The ball diameter can be 1; 2; 2.5; 5 or 10 mm. The application time of test force must lie between 2 - 8 s.
The duration time of test force lies between 10-15 s. It can last longer when using soft materials. 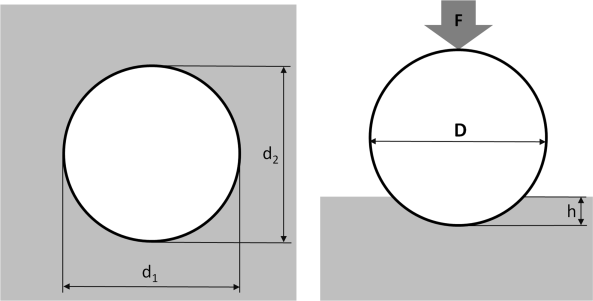 The test load has to be chosen in a way that the indentation diameter is between 0.24 - 0.6 D.
The distance between center of indent and edge of the specimen has to be at least 3d (hard materials 2.5d). The centers of two indents have to be at least 6d apart (hard materials 5d). In the past a hardened steel ball could be used up to Brinell hardness 450. A cemented carbide (hard metal) ball can be used up to 650 HB. The method is not applicable for harder samples. Brinell hardness values are only comparable for the same stress level F/D2. The hardness test according to Brinell has for the first time ever been introduced at the World Fair in Paris in 1900, where the Eiffel Tower has been built up as one of the most significant metallic structures.